Nokia has just officially announced a new mobile phone, Lumia 610 NFC. This phone is claimed to be the world's first Windows Phone hardware that uses NFC for payment transactions electric (electronic payment). The latest smartphone from Nokia is a modified version of the 610 Lumia, which debuted at the Mobile World Congress last. At Lumia 610 has been embedded applications that support payments. 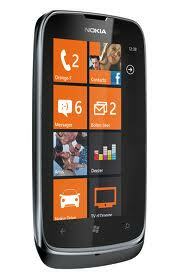 This Lumia 610 have developed support services PayPass Mastercard and Visa PayWare. Of view, Nokia Lumia 610 NFC very similar to the Nokia Lumia 610 (non-NFC). Windows phone is equipped with 3.7-inch WVGA LCD display, 5 megapixel camera with 720p video, 800MHz processor, 256RAM and 8GB of internal memory. The Nokia was trying to present some of the accessories that are compatible with NFC, such as the Nokia BH-310, the Bluetooth headset NFC. Lumia 610 Nokia NFC will be released in the UK, so hopefully in July Smartphone is already filling the shelves at electronics stores. in the UK Nokia Lumia 610 NFC issued by the Operator Orange.